Cubby has been making strides in his occupational therapy sessions. What’s more, he is getting better at dealing with people outside his familiar surroundings. Better than I am at helping him to deal with people, at least. He is that exasperating mix of being touch-aversive and an adorable toddler. People are in his thrall, and he loves to flirt….until that flirting becomes physical. I don’t know why strangers are so compelled to touch children. I suppose it is like the way I can’t resist a puppy, though if I’m warned the dog might bite, I’d think twice about stroking him. When he begins to get distressed, he initially gets squirmy, trying to back way. Yet these supposedly neurotypical masters of body language don’t pick up on this. So I’ve become more direct. I’ve tried to tell people that he doesn’t like to be touched. It doesn’t work. I’m incredulous that it doesn’t work. If, as an adult, I asked not to be touched, I’m fairly certain that would be respected. But it is almost like a challenge. They are provoked by seeing that he is fine being touched by me. I must be an overprotective mother who refuses to let others come near her precious cherub. They think, maybe he doesn’t like others touching him, but I’m sure he’d be fine with me. They continue, getting into his personal space, stroking his cheek, or rubbing his hair, right until he starts screaming. And even then, instead of shamefully admitting defeat, they ask me what is wrong with him! He doesn’t like strangers to touch him. What is wrong with YOU? 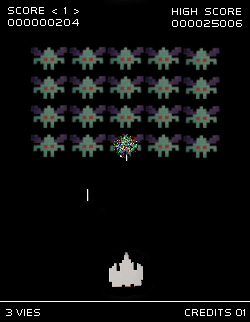 The whole thing reminds me of the old video game, Space Invaders. It doesn’t matter what lasers he shoots, The Aliens are advancing, ever closer. My defensive bunkers aren’t offering adequate protection. When they touch him, it will be Game Over. So now that he has a few weeks of Early Intervention OT under his belt, he is comfortable with giving a high-five. It works like my very British arm-stretched-out-for-a-handshake manoeuvre, that also keeps huggers at bay. Just enough contact to make all parties happy. Almost everyone. Pudding really struggles with this. She is one of the Invaders. This is her Space too, and she is driven to touch everything around her. Long before her diagnosis, our ‘Wheels on the Bus song’ featured mummies saying, “Don’t touch that.” Those same strangers who find me over-protective with Cubby, must also wonder why I’m allowing my preschooler to handle everything, and everyone, she sees. Her body awareness is so poor that half the time she isn’t even aware she is touching, or leaning, or making contact. The other half of the time, it is just a compulsion. I’ve watched her run to something in the distance, so attractive to the eye that she has.to.touch.it. Touching things just makes her feel better. In a new place, the first thing she asks to do is to touch the ceiling. We think it is her way of feeling the physical boundaries, when her senses are so unreliable and overwhelmed. I’m terrified of going to houses that aren’t Pudding-proofed. There is no way I can keep her from touching (and probably breaking) interesting but delicate artifacts. Just like there is no way she can stop touching her brother. Together, somehow, they have come up with their own thing. Yesterday I heard the two of them giggling, something that generally indicates trouble. I went down to the basement to find that she had covered him in stickers. There must have been at least 30 stickers on him. Cubby, like many toddlers, likes stickers, but he doesn’t like the sensation on his fingers. He was thrilled to have the end product on his clothes, without having to touch them. She was just as happy. I let them carry on until the stickers were all gone. I’d never thought of this solution, but it was perfect. Bonus points, and the high score goes to my two players. Hopefully the next level comes with defensive bunkers that are in tact, and a whole new set of powerful lasers. Cubby does not like to be touched. That isn’t really true, because he is a cuddly little guy with me, and with daddy too. He needs physical contact to get to sleep, but wants lots of hugs and cuddles throughout the day too. Cubby does not like to be touched unless it is on his terms. Pudding likes to touch. She is affectionate, perhaps over-eager in her affections, and is definitely a hugger. We’ve already begun the process of explaining who you can and can’t hug, but it isn’t that easy. Pudding wants to hug her brother, and because he reacts so badly to those hugs, we’ve had to ask her stop. After some time, she has accepted that Cubby does not want to be hugged. Instead she kisses him on his head where he feels less sensitive. Success. Occasionally I’m a little sad at the sight of Pudding stretching out her arms to embrace him, then remembering and dropping them. Sometimes she’ll try to join in on a hug and gets upset when I turn her away. I hate this, but we all have to learn to respect Cubby’s sensitivity. The lesson is just harder for her. Yesterday, when we had our second round of this session of the sibling study, I mentioned to the examiner that Cubby does not like to be touched. All of the session is filmed, and many segments require him to be seated at the table. Every time she strapped him in that chair, he flinched at the touch. Ultimately she suggested we terminate the session, and return another time, but I declined that option. For one thing, I know he’ll have the same reaction next time. For another, a return trip of almost 4 hours plus testing time is just too much on top of the various therapies and other commitments we have. We pushed through, culminating with the blood draw for the neurobiological portion of the testing. This went really badly, the phlebotomist missed the vein in the first attempt, he resented being held down, and he couldn’t stand the feel of the dressings on his little arms. He was distraught, and carried on screaming until he fell asleep in the car, exhausted. Of course, we had to coax her into doing something she has learned not to do, but the two of them hugged. They both enjoyed it. I’m hoping this is the first of many.